Added on January 2, 2018 by Eric Bernasek. Hiroshi Yoshimura’s 1982 debut album, Music for Nine Postcards, was first re-released (on CD) in 1999 and included liner notes in which Yoshimura himself described how he’d composed the nine short instrumentals “while catching the waves of the scenery out of the window and feeling the sounds form.” According to his recollection, the simple, repetitive and unpretentiously lyrical pieces took their inspiration from natural phenomena like “the movements of clouds, the shade of a tree in summer time, the sound of rain, the snow in a town.” The resulting musical fragments were short enough for him to jot down on postcards and send to friends. When it was time to record, Yoshimura treated that material like so many seeds, encouraging his ideas to grow and flourish by repeating each fragment, over and over again, while allowing for slight variations that would expand on the original ideas. During the period that this music was gestating, Yoshimura visited the Hara Museum of Contemporary Art in Tokyo, where the museum’s “snow-white art deco style… [and] the trees in the courtyard which can be seen through the museum’s large window” reminded him of his project, prompting him to wonder if his music might fit that environment. A simple request resulted in the museum’s accepting Yoshimura’s music as a soundtrack to their space. And the numerous inquiries that museum visitors made about the music helped to ensure that Yoshimura’s collection would eventually become publicly available. The resulting album was Yoshimura’s debut as well as the first installment in Satoshi Ashikawa’s series “Wave Notation.” The albums in that series represented Japan’s kankyō ongaku, a literal translation of the phrase “environmental music,” which had been applied to Brian Eno’s ambient music when it first arrived in Japan in the late ’70s. While Eno had suggested that his early ambient works might fade into the background and create a meditative space in which listeners could think more deeply, Yoshimura’s environmental music was intended to become part of a physical space in order to color one’s experience within it. In the years following his debut Yoshimura would create music for galleries, museums, train stations and other buildings both public and private; between 1986 and 1988, he created veritable soundtracks to the prefabricated houses built by Japan’s Misawa Home Corporation. Certainly environmental and ambient music exist within two largely overlapping sets in the same musical Venn diagram. Moreover, their distinct yet similar purposes are not mutually exclusive. 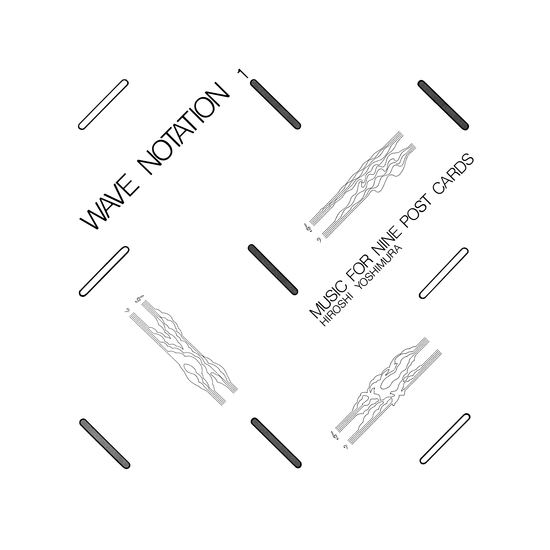 At the same time, the way in which Yoshimura approached Music for Nine Postcards in particular is remarkably well suited to what he saw as the genre’s environmental utility. The nine tracks on the album are all comprised of the same two elements: a Fender Rhodes electric piano, accompanied by long, pure tones on an unspecified synth. There are no added effects save simple reverb. Each piece on the album consists of, in only a few words, languid bell tones against placid drones. In most cases, Yoshimura uses the Rhodes to repeatedly play a single melodic figure, with its own distinct rhythmic signature, alternating between two or more harmonic iterations or, less frequently, passing through a recognizable harmonic sequence. This extremely restrained palette means that the tracks can seem to blend together, allowing colors and textures to remain static from one track to another, while the mood subtly shifts as the purely musical content – the melody, the rhythm, the harmony – does change. These two aspects work hand in hand: the physical character of the music has a constancy that suggests physicality, as if an object, while it is at the same time permitted to pass through changes of mood or emotion. Although each piece is only a few minutes long – the shortest around three minutes, the longest nearly seven – it’s easy to imagine each individual track stretching out indefinitely, adding its own unique color to either a specific physical space, like one room in a house or a gallery, or a particular time of the day. The various moods are uniformly calm and wistful, evoking the subtly discomfiting melancholy of nostalgia. On Nine Postcards, selections like “Water Copy,” “View from My Window” and “Dream” are uniquely poignant and well executed. The only track that stands out for negative reasons is “Urban Snow,” which includes the sound of Yoshimura’s speaking voice, heavily accented and embellished with echo, repeating the words “Snow. This is Tokyo.” The track limits the album’s usefulness as environmental music, both because the voice is robotic and distracting and because its mere presence compromises the purity of the rest by breaking the spell that was cast by the album’s overall restraint and uniformity.